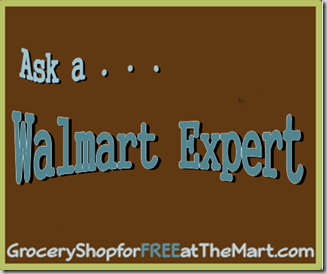 Ask A Walmart Expert: How Do You Coupon Like A Man? How do you coupon like a man? I have to admit, this one struck me as a little weird. I my first instinct was to just leave it alone but maybe there are men out there that want to coupon but struggle with the stereotype that couponing is for women. If that’s you, let me at least share where my couponing habits are different from my wife’s. Not that my wife doesn’t plan out her trips but when I go shopping, I’m there to work. I know what I want, where it is, what coupons I need and I go get it. I vividly remember my grandmother wandering up and down every aisle, looking for peelies or unadvertised deals. I’d shoot myself if I had to do that. My wife has a meal plan of what meals she wants to cook and shops around that but not me. I buy what the deals are and we eat that. A few week ago we ate pork chops every night for 2 weeks. We got tired of pork chops but boy we ate cheap. Granted, I have actually done this before. A lot. But I’ve seen people hand their coupons over like they are half-expecting to be scolded for daring to use coupons. Don’t do anything that makes anyone think you are unsure about what you are doing, if you look and act confident then the cashier assumes you know what you are doing. I have been in many situations where something has gone a little off but the cashier just pushes it through because I look like I know what I’m doing.